It is a fun family Christmas Show that is great for corporate Christmas parties, Children Christmas parties, Club holiday parties and church Christmas family events. Richard mixes in music, kid comedy, ventriloquism, magic and a whole lot of audience participation. "The kids truly enjoyed your Ho Ho Holiday Show! You had a big crowd for each show and all I heard was laughter!" The kids will laugh when Frosty the Snowman can't remember the words to his own song. Giggle when the Mrs. 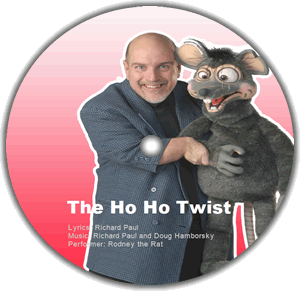 Clause says Richard has been a naughty boy and do some wiggling and twisting with Santa's best buddy Rodney the Rat as he sings his Christmas song the Ho Ho Twist. Ventriloquist Richard Paul's multitude of colorful wacky characters, goofy gags and Ho Ho helpers from the audience mix up a forty-five minute batch of Cool Clever Christmas Fun that is a treat for the entire family, a show that will leaving laughing and wondering how those puppets were talking. Santa and I had the opportunity to watch Ventriloquist Richard Paul's Ho Ho Holiday Show. We both really loved the performance. It was so fun to hear the children laughing at the funny jokes, sing along with the music, and try to figure out how Richard made that little Coke bottle disappear. We really enjoyed Rodney the Rat's silly humor and how he was trying to trick the kids into thinking he knew some secret information about Santa. We loved it when Rodney sang a song we never heard before called the Ho Ho Twist. We downloaded the song to our I-Pod and we have just asked our Zumba instructor to add it as part of our class's song list. If you are looking for a show that will keep everyone laughing and dancing then Santa and I highly recommend Ventriloquist Richard Paul's Ho Ho Holiday Show. PS: Santa also wanted me to tell you that he could see Richard's show from space, one night when he was flying up to the international space station to deliver some of my cookies. WOW! What a Show! Thank you for taking the time to visit Maconce Elementary School. Your presentation was very creative and captured the interest of the children. Students and staff, alike enjoyed your presentation and the audience participation.